Let A1 Window Cleaning earn your trust with our no-obligation, free trial offer. Prompt, efficient, professional, and courteous service from technicians you ACTUALLY WILL like having in your home. Up Front, No Obligation, Complimentary Estimate and Evaluation of your home’s glass cleaning needs. A1 Window Cleaning specializes in taking expert care of your home’s window cleaning needs. We have the expertise, experience, equipment, and the integrity to make your windows look their best. 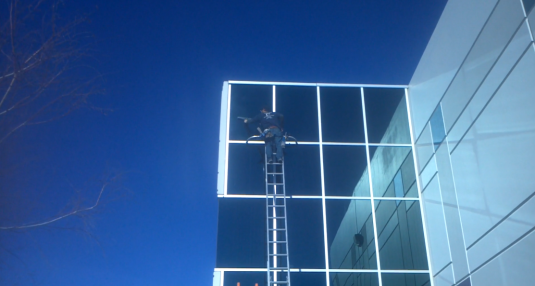 A1 Window Cleaning offers all types of commercial window cleaning. With the experience, training, insurance, and professionalism needed, A1 Window Cleaning will take care of your business’ needs. A1 Window Cleaning specializes in the restoration of water stained and scratched glass. 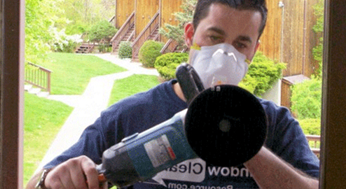 We can save you big money by restoring your glass as opposed to replacing it. To provide our customers with the very best service experience they’ve ever had, while providing the healthiest and most beneficial cleaning possible. At A1 Window Cleaning, it is our goal to set the bar for professionalism, integrity, and quality service in the window cleaning industry. 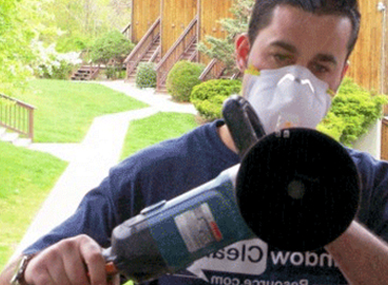 A1 Window Cleaning was started by 6th generation Nevadan, Ian Callahan. As a new college student at the age of 19, Ian was having trouble finding a job that would work with his school schedule. With the last $100 in his wallet, he bought some window cleaning gear, learned how to clean, and hit the streets. Within a year’s time, his business turned into a full time business venture. A1 Window Cleaning has the equipment to safely and effectively clean any windows you may have. We train our technicians to properly walk on roofs, use ladders safely according to OSHA standards, and even use ropes if needed in rare cases. A1 Window Cleaning uses gear designed to efficiently clean the interior of windows in a residential setting. This means we wear booties and take the needed precautions to make sure no damage is done to sills, floors, or other adjacent furniture. They did a great job and even put up with my dogs! I wish I had specifically asked them to do the windows on my deck, but I didn't and didn't notice they weren't done until they had left. I would definitely recommend them! A1 is truly A #1 with me! They are professional, prompt, and very reasonably priced. I have recommended them and will continue to refer my friends, family and clients to them. From soap scum in the bathrooms, to dirty windows, inside and out, to gutter cleaning/repair, they do it all and they do an awesome job! It is amazing to see the world through clean glass! This is the first time we used A1 and we are very pleased. Very professional and they did such a wonderful job. Will definitely use this company again. Windows turned out great. Fast work too ! I had A1 out to clean my windows, screens and tracks at my home that I just moved into. From the first phone call Mitch was very professional and prompt. Showed up on time, had VERY reasonable prices and did an excellent job! He even cleaned a very high interior chandelier that I thought was impossible to reach! I would highly recommend this service to anybody in need. A1 cleaned my windows and my shower glass today and I am very happy with the service that I received. The two gentlemen that performed the service were professional, friendly and I felt very comfortable with them in my home. Our shower doors were horribly etched by hard water stains and soap scum that I couldn't remove despite my best efforts. A1 was able to make them look almost new again for a very reasonable price! 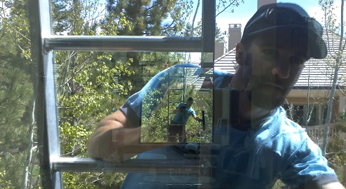 Should You Hire A Window Cleaning Expert Service In Reno? A locally owned and operated company that enjoys an outstanding reputation and rapport with our customers. Fully Licensed, including carrying insurance for property damage to others. Top of the line and cutting edge equipment and processes. Do you need window washing services but aren’t sure of the service you’ll be getting? No problem! Have a question about our services? Visit our FAQ section for some commonly asked questions and answers. There are many people in the window cleaning industry that give window cleaners a bad name. Beware of cleaners with “too good to be true” pricing. 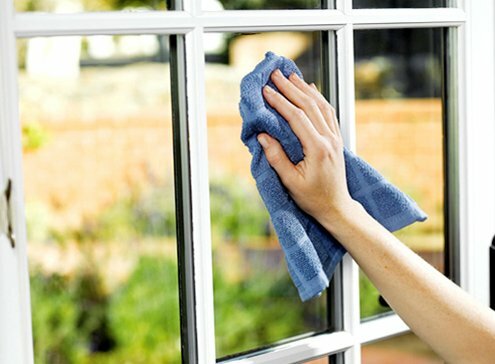 Don’t risk your home, business, or belongings by hiring unscrupulous and fly-by-night window cleaning services. If you are not 100% thrilled with our service, we will rush back to your location and make it right! 48 Hour Rain Guarantee. Optional Extended Rain Warranty. Fair, up front, and consistent pricing that directly reflects the value of our service. Time for a window cleaning? 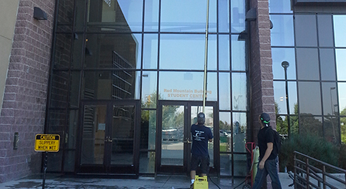 A1 Window Cleaning is a local company in Reno Nevada that specializes in commercial and residential window cleaning. Other areas of specialization include scratch repair and stain removal in surrounding areas of Northern Nevada. A1 Windows handles projects big to small and can assist with any of your window washing needs. We are happy to hear from you and will provide you with excellent and high quality customer service while committing to satisfaction guaranteed.